Home » » Top Police Officials Visit Family Of Cop Killed By Reckless Driver in Ghana. Top Police Officials Visit Family Of Cop Killed By Reckless Driver in Ghana. Director General Welfare, COP/Dr. 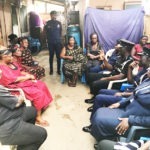 Akuffo Dampare paid a visit to the family house of the late General Constable Emmanuel Nii Odartey Lamptey at James town to sympathise with the bereaved family. Constable Emmanuel Lamptey was knocked down and killed by a speeding Toyota Land Cruiser with registration Number GG 1382-17 driven by suspect Benjamin Abash, whilst on official duty on the Tema-Akosombo road. The incident happened after the driver ran into a barrier at the Check point and dragged the deceased policeman to a distance of about 50 metres. Benjamin Abasah was then arrested and detained, whilst the accident vehicle was impounded. ACP/ Ernest Owusu, Tema Regional Deputy Commander, Supt. Rev. Hannah Sackey and Supt. Charles Asiamah Agyei, Afienya District Commander (where the deceased was stationed) accompanied COP Dampare to the deceased's house. 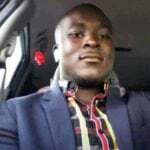 Constable Emmanuel Lamptey met his untimely death just six months after he had tied the knot with his sweet heart. The wife, who was then heavily pregnant, delivered a bouncy baby girl, a day after the death of the husband. 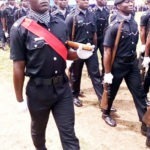 The death of junior officers is often left in the hands of District/Divisional Commanders to deal with, but the new Director General Welfare, COP/Dr. Akuffo Dampare decided to visit the family to mourn with them.